Another Twitter success pour moi! 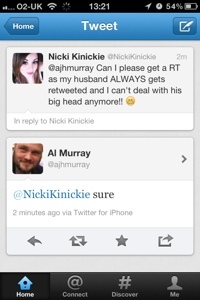 | Nicki Kinickie Nicki Kinickie: Another Twitter success pour moi! Another Twitter success pour moi! ﻿ Yes, I'm afraid I have yet another Twitter story but the war with my hubby goes on (he is currently winning hands down 5-2). Over the bank holiday weekend though, a familiar face felt my sympathy and replied to my pathetic cry for acknowledgement! Mr Al Murray better known to some as the pub landlord upped my celebrity responses from 1 to 2! Very exciting indeed!